This new large-displacement Leaning Multi-Wheeler (LMW) ride is powered by a liquid-cooled, in-line, 3-cylinder engine. 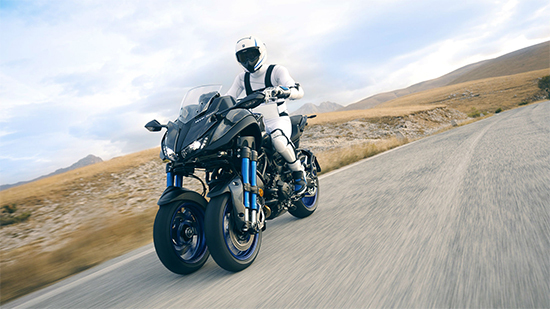 The NIKEN features LMW technology to reduce the effects of changing ride environments and to deliver a high feeling of stability when cornering. It achieves excellent performance for spirited and sporty riding on various road surfaces and the capability to freely carve through the continuous corners on winding roads. The body design makes full use of the unprecedented front-end suspension mechanism, pairing 15-inch front wheels with dual-tube upsidedown forks that visually accentuate the machine's sporty performance and create a high-quality look and feel at the same time. New Yamaha NIKEN.